Cancer : Is Lemon the Latest Cancer Fighter? Among citrus fruits, lemon is most finicky. It’s sensitive to low temperatures, which means it’s difficult to cultivate. But, unlike other citrus trees, the lemon tree bears fruit continuously. And if you can get past the fruit’s sour taste, you’ll find it provides a number of health benefits. Including the ability to protect against cancer, according to research. Lemons are rich in vitamin C and potassium. The vitamin C content and storage capacity of lemons made them useful for sailors in the battle against scurvy during long voyages. Lemons also contain substances known as terpenes. The term terpene probably conjures up images of cleaning solvents, but while naturally occurring terpenes are actually used as alternative to synthetic terpenes in many natural cleaning products, the primary health benefits of terpenes revolve around some impressive anticancer effects—in prevention and possibly even treatment. The most important terpene in lemons is limonene. Limonene and related terpenes have shown considerable benefits in animal studies against a wide number of cancers. Preliminary studies in humans are also showing promising results. For ranging from six to 12 months while taking d-limonene. In a recent study conducted at the University of Arizona Cancer Center, 43 women with newly diagnosed, operable breast cancer electing to undergo lumpectomy (surgical excision) were given 2 grams of limonene daily for two to six weeks before surgery. Blood and breast tissue were collected to determine the level of d-limonene and its metabolites, as well as changes in systemic and tissue biomarkers of breast cancer risk or carcinogenesis. Results showed that d-limonene was found to preferentially concentrate in the breast tissue, reaching high tissue concentration, whereas the major active circulating metabolite, perillic acid, did not concentrate in the breast tissue. Results also showed that d-limonene supplementation resulted in a 22 percent reduction in the expression of tumor markers. Specifically, d-limonene reduced the expression of breast tumor cyclin D1. Cyclin D1 is one of the frequently overexpressed proteins and one of the commonly amplified genes in breast cancer. The gene that leads to cyclin D1 formation is an estrogen-responsive gene. The overexpression of cyclin D1 occurs in more than half of invasive breast cancers. Recent evidence also shows that cyclin D1 interferes with the anticancer effect of the chemotherapy drug tamoxifen in estrogen receptor–positive breast cancers—potentially accounting for treatment failure with tamoxifen therapy. The benefits seen with d-limonene in this study should be followed up in women with breast cancer who are expressing cyclin D1. D-limonene is available as a dietary supplement, but it is easily obtained from the diet. In lemons the highest content of limonene is found in the peel and white spongy inner parts. 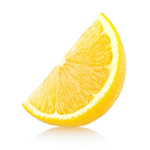 A typical, average-sized lemon has about 300 mg of d-limonene. One of the best ways to take advantage of the health benefits of lemons and achieve adequate d-limonene intake is by juicing them. But since lemon juice is usually too sour on its own, most people mix it with other juices. Fortunately all you need to do is add half a lemon or one whole lemon, complete with peel, to just about any fresh fruit or vegetable juice including green vegetable juices. If you are going to juice whole lemons, be sure to choose organic. If you can’t find organic lemons, soak or spray non-organic ones with a biodegradable wash, then rinse. Other dietary sources of terpenes are other citrus fruits, berries, cherries, and volatile herbs such as peppermint, basil, thyme, and rosemary. To learn more about the medicinal effects of fresh fruit and vegetable juice, please consult my completely revised and updated The Complete Book of Juicing (Random House, 2013). This article is reprinted with permission from Dr. Michael Murray's Natural Living News. For more articles like this one, visit www.DoctorMurray.com/NLN. Dr. Michael T. Murray is one of the world’s leading authorities on natural medicine and the author of more than 30 bestselling books, including The Encyclopedia of Natural Medicine. He is a graduate and former faculty member, and serves on the Board of Regents, of Bastyr University in Seattle, Washington.